Coach Trevor Bayliss dismissed suggestions that England tampered with the ball in the fourth Ashes Test against Australia in Melbourne. 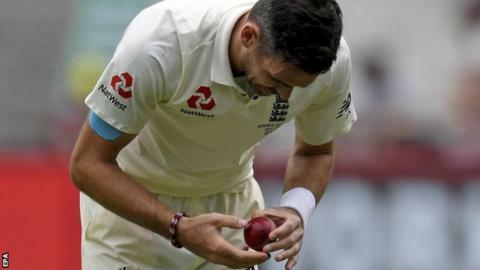 Australian television broadcast footage which it claimed showed James Anderson digging his thumb nail into the ball during Australia’s second innings. Former Australia leg-spinner Shane Warne said Anderson’s actions “might get people talking”. “I went to the umpires and there was no problem from their point of view,” Bayliss told BBC Test Match Special. Australia – 3-0 up in the five-Test series – reached 101-2, trailing England by 63 runs, before rain ended play early on day four. On a placid MCG pitch offering the bowlers little assistance, England were looking to make the ball reverse swing. That often involved fielders throwing it into the ground so one side became scuffed up. Local television showed close-up pictures of Anderson, England’s leading wicket-taker of all time, working on the quarter-seam. Footage was inconclusive, although Anderson was working on the shiny side – in theory, a side he did not want to alter when attempting to get the ball into a state to reverse – and could have been cleaning it, smoothing it or removing something that had come loose. What do the Laws of Cricket say? Under Law 41, it is an offence “for any player to take any action which changes the condition of the ball”. If the action taken by the fielder does not fit any of these, the umpires shall consider the condition of the ball unfairly changed. At that point the umpires would ask the captain of the opposing side if they would like the ball to be replaced. What did the umpires do? 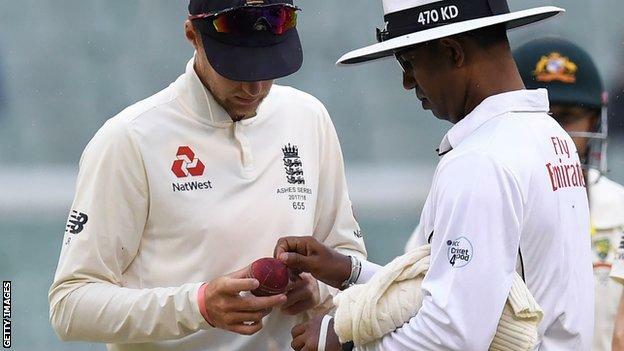 Umpires Kumar Dharmasena and S Ravi spoke with England captain Joe Root, but they were satisfied that nothing improper had taken place and the ball was not changed. “As soon as I saw the headlines I raced to see the umpires and they said there was nothing to worry about,” said Bayliss. He explained that Anderson was “cleaning the ball”. Bayliss added: “Kumar said he had no problems with both sides cleaning the ball, but he’d like them to do in front of the umpires so they can see nothing untoward is going on. 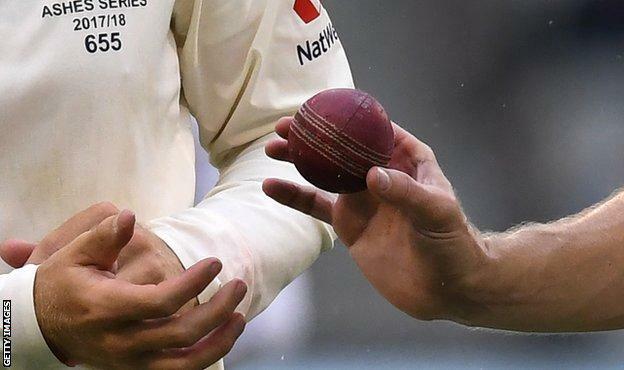 England and Australia have been warned about throwing the ball into the turf in an attempt to change its condition, something which Bayliss says “every team in the world” does. Former England spinner Graeme Swann on Test Match Special: “It is ridiculous. It has annoyed me. The people who are making the story should know better. “How you can use the back of your nail to push a bit of leather down on the shiny side and be accused of ball tampering is beyond me. Former England captain Michael Vaughan on TMS: “It looks to me that Jimmy Anderson has got the ball in his hand and has just tried to push down a flap on the shiny side to make sure it is smooth. “He is not scratching it. He is polishing it to make it as smooth as possible. “If it was the other side of the ball, the rough side, it might be a problem but he wouldn’t be doing that to the shiny side. The ball-tampering allegations come on a tour where England have been blighted by off-field problems. On one occasion, wicketkeeper Jonny Bairstow was accused of ‘headbutting’ Australia opener Cameron Bancroft in a Perth bar, something that both men later described as “without malice”. England have already lost the Ashes, but are looking to avoid a second consecutive whitewash and ninth successive Test defeat down under. “We’ve got an opportunity to win and that’s the attitude we have to take into tomorrow,” said Bayliss.